Lasvit, the Czech Republic glass manufacturer, unveiled Lasvit Liquidkristal by Ross Lovegrove at Milan’s Triennale Design Museum. Lasvit Liquidkristal is a new product offered from Lasvit’s Glass Architecture Division. The exhibition featured a pavilion comprised of three forms, each measuring 180ft in diameter and 46ft in length. Each wall surface is composed of 24 freestanding crystal panels, measuring a total of 860ft. Leon Jakimic, founder and CEO of Lasvit, says: "Lasvit Liquidkristal designed by Ross Lovegrove is a milestone in Lasvit´s product development. 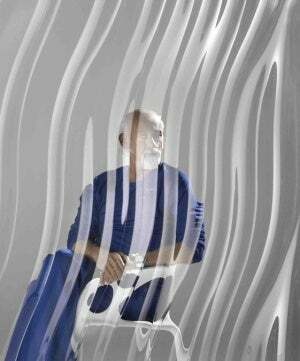 First, it represents our forward-looking collaboration with Ross Lovegrove, a contemporary master in design. Second, to bring his design to life, Lasvit pioneered a unique thermal transfer technique. Finally, Lasvit LiquidKristal is our company’s bridge to the world of architecture, useful as a crystal partition or screen and as insulated glass units for exterior facades." Liquidkristal is the result of an innovative process that the designer defines as high precision heat transfer. Lovegrove worked with Lasvit for more than a year to create the mobile, changing surfaces, which is inspired by the fluid, organic forms found in nature. The company deployed its most advanced technology to produce the transparent, undulating crystal panels, which appear dynamic, changing and capable of transmuting their shapes in a futuristic kaleidoscope. Lovegrove notes: "There is a magic in glass in the way light and transparency are captured in the fusing process, one moment liquid, the next solid. This is something that can be harnessed and predicted in the meeting of design, physics and technology." The are several uses of this new surface, ranging from pavilions in interior and exterior environments, such as divisions in public spaces or boutiques, to partition walls or large, spectacular full-length windows capable of transforming a building’s architecture. Lasvit Liquidkristal by Ross Lovegrove combines technology and design to create a new architectural product, replacing the enormous monotony, typical of large glass structures with natural surfaces and their abundant variety, richness and coherence. Via fluid dynamics, Lovegrove Studio and Lasvit digitally explored large-scale distribution and densification of patterns found in nature. Working with mathematical models, the behaviour of glass was simulated under controlled thermo induction. This produced a highly informed line code, which serves as the blueprint for the production process, where highly precise temperature control imbues the glass surface with the beauty of optical effects seen in water. Working with Lovegrove, Lasvit’s research facilities, led by Tomáš Kamenec, developed a special flexible mould system to capture this effect. The finished product is highly customisable, allowing large-scale pattern aggregations over multiple sheets. At the Triennale these panels form a spatial experience, where the ceiling is used for projections and reveals the digital beauty of natural observation.